Chris Coleman of Wales took charge of his first Chinese Super League match yesterday with Hebei CFFC. 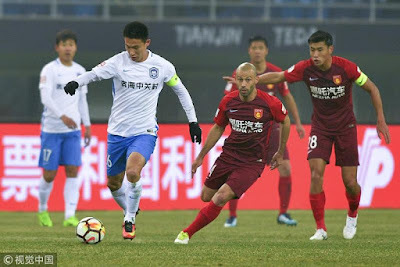 It was not to be a classic however as they drew 0-0 away to Dalian Yifang. This was the Welshman's first competitive game as a manager since his sacking from English side Sunderland in April. The spell in the Northeast of England was not a good one for the boss and he will be hoping to turn his fortunes around in China. How is it looking so far? A draw to start his time in China is not great especially when it was against the team sitting second bottom, although it is still very early days. It is worth noting that his side despite sitting ninth in the league is only nine points of Beijing Guoan in the top spot. Then with 12 games of the season gone and 18 remaining, there is still a lot to play for in the league. Meanwhile, he also has a World Cup star in Mascherano to return to his squad. The Argentinian did not have the best World Cup but his experience and ability could prove vital for Coleman. The coach has previous of getting the best out of average players too. The evidence of this was showing when he guided his own country Wales to the European Semi Final in 2016. Time will tell if his experience in China will be a success but it did not get off to the worse start. He will also be disappointed though as Hernanes his Brazilian midfielder missed a penalty in the 93rd minute.